In the booklet which accompanies the truly wonderful Ben Lennon & Friends: The Natural Bridge (reviewed in these pages) it is stated that Ben and three of his friends had "previously recorded an album with Claddagh Records in 1989 entitled Dog Big and Dog Little. This album has since become recognised as the definitive recording of the Fermanagh/Leitrim style of traditional music." Having so much enjoyed this year's offering, I decided I really ought to have a listen to that of a decade ago - though not necessarily with the idea of reviewing it. In the event, the contrast between the two records is so instructive that I've felt impelled to have a go. I'm sure I'm not alone in noticing that there is an element in Irish music these days which is moving towards the older style of traditional playing - perhaps in reaction to the technically brilliant and superficially exciting 'modern' tradition. Or, maybe it's just that, as one gets older, subtlety begins to seem more alluring? Whatever the case, the difference in these two records is really quite marked ... clear evidence, if it were ever needed, that the 'evolving tradition' has lost none of its creative power despite the nearly complete collapse of the music in the '40s and '50s. Ten years ago, the music was noticeably faster - a pair of reels, twice through, took around 2 minutes and 10 seconds to judge from the four sets on offer here. On The Natural Bridge the average seems to be about 2:35. Twenty five seconds doesn't seem a lot, but it makes that enormous difference between 'hurried' and 'relaxed' - at least for this listener. As Ben's brother Charlie said, regarding the McNamara Family record, "the tempi are such as to ensure that each piece is given time to breathe freely and express its own characteristics, a welcome change from some of the present day offerings." I'll second that - and add that any music which sounds 'too fast' can actually make me feel physically uncomfortable. There's also the matter of fashion in music (as in so much else) - which can impel a player, or singer, to create a sound which is - with hindsight - absolutely characteristic of an era. In pop music this is often hideously apparent - but it can be heard in a more subtle form in traditional music too, particularly since the onset of mass communication. Here, Ciarán Curran plays cittern (from the photos it could even be the same instrument) in a way which sounds exactly as if Andy Irvine or Donal Lunny were playing it. Ten years later it sounds, I would guess, like Ciarán Curran! 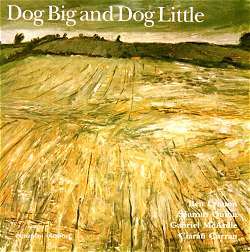 Don't get me wrong - it may be that The Natural Bridge pleases me more, but Dog Big and Dog Little is a fine record. Track 1, Jimmy Duffy's Barndances it just great (sound clip) - and I'm always intrigued that the Irish use polkas or hornpipes (as here) for presumably the same dance that the English almost invariably do to 12/8 tunes. Mentioning polkas prompts me to let you hear a bit of the final track, Mrs Devlin's, a pair of fine examples from Séamus Quinn's home town of Derrygonnelly (sound clip). There's also one way in which I prefer this record to the new one, and that's regarding Gabriel McArdle's singing. Here he gets four songs - and two are unaccompanied. Far be it from me to suggest how other people should sing - but if I ever have the good fortune to be in a session with him, I'll surely ask him to sing everything solo. His Edward of Lough Erne Shore is delightful - a song he got from his father, but here he sings the melody used by the great Mick Hoy of Blaney, to great effect (sound clip). And if that weren't enough to endear me to him for ever, he also sings Burns' Now Westlin Winds (a.k.a. Ode to Autumn). A wonderful song which everyone seems to be having a go at these days ... if you die without hearing it better sung than here, you will have no reason to complain.